Below are some examples of websites that I have developed. In the description of each site I illustrate some of the principles of Web Presence as they apply to the sites and the businesses they support. As you can see the sites have some characteristics I consider important in a good website but are each different and are suited to the businesses they support. This is a site I built for my wife's business. She works out of our home repairing and appraising antique dolls. She also provides her services through a couple of local antique shops. Because she does not have a separate bricks and mortar shop it was hard for people to find her. When they did find her or heard of her it was difficult for people to know exactly the services she provided. She got calls from people asking if she could do things only to be told she was not able to provide that service. She also probably did not get calls from people who heard of her but figured she could not help them. The site allowed people to easily find her online and provides potential customers with a good idea of the types of work she could do for them. The site got her contacts from across the states and even as far away as Scotland. She was even contacted by the producers of the TV show American Pickers to be an expert appraiser for one of their episodes. Part of her business is selling dolls on commission for some of her customers. These dolls are antique or vintage and represent unique items a serious collector will pay a good price for. She normally sells the dolls in shops in Modesto and through doll shows in Northern California that she attends. To help her reach a wider range of doll collectors I have listed some of her more unique dolls for sale on her website. 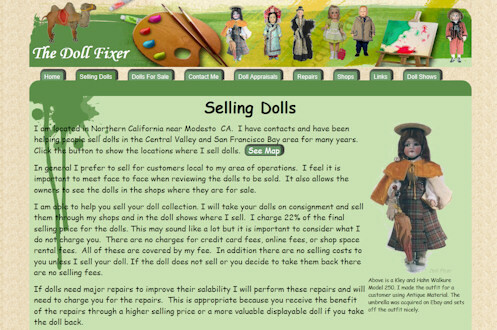 I take the pictures for the dolls and set up the online listings and online purchase buttons on the web pages. The dolls are also listed through a data feed to Google marketplace. This extra market place for her dolls increases the likelihood they will be seen by that collector who "just has to have" a specific doll. When building the pages on the site and in particular the dolls for sale pages I always keep an eye on the SEO ranking for certain key terms related to the doll business. Because there is a lot of other sites selling dolls including Ebay it is important that a potential customer finds her site and her dolls easily when they do a search for dolls for sale or a specific doll. It is important to consider the many ways a person will search for a doll. You need to consider and incorporate all factors including things such as the manufacturer, country of origin, model numbers, common nick names and other items people may use to find the doll they are looking for. 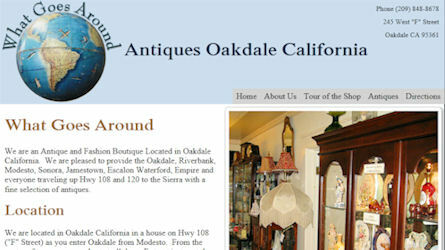 This is a site I built for an Antique, Collectible and Gift mall in Modesto. They had a good location but were off the main street. They got little or no foot or drive by traffic. I built the site and provided them with detailed listings in all the business directories. This has provided them with a steady stream of new customers who invariably say I never knew you were here until I looked on the web. The site is going on its third year and there is still a steady stream of new customers finding them on the web. Because the mall is a collection of different dealers I am constantly updating the dealer listing to highlight the types of merchandise available. By highlighting dealers with special merchandise like coins, sports memorabilia or candles it brings in people looking for these specific items. They usually check out the rest of the mall when they come in and put it on their list of places to go when the need just about anything. This highlights the need to provide detailed website content and to keep the content current. Many times people building a site for their business will limit the content so they will not have to go in too often to update it. This is a site I built for a local plant nursery. 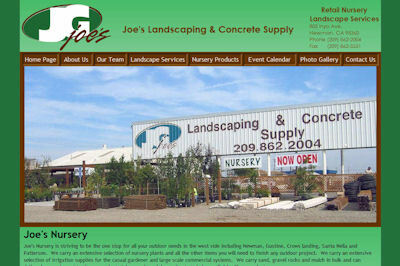 Joe was adding a commercial nursery to his existing landscape and concrete business. Newman where the business is located is a small town and he wanted to make sure people in the surrounding communities knew he was there and what he had. Web presence was important to make sure people in the area knew he was in business. The content of the website was important to let potential customers know he had what they wanted and that they could save a long trip to a distant big box store by shopping locally with him. In addition to highlighting the nursery business the web side also documents the commercial landscape and concrete work Joe does. 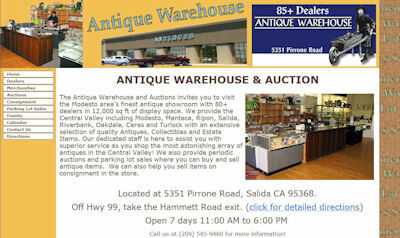 The Antique Warehouse had an existing website that had grown out of date and was not being updated with any frequency. They often did not post details of upcoming events on the website. I took over maintenance of the site and added a lot of new content. I helped them keep it current with events occurring at the shop. I also improved their web presence so people can more easily find the website. I now provide updates to the site as needed and take all the pictures of events in the shop and new and unique merchandise coming in the shop. After about a year the owners decided they wanted to liven up the site some. I developed a new color scheme, a new page header and background and updated all the pages to use the new scheme. The work I do for them shows the importance of maintenance. Having professional maintenance for the site gives them a site that fully supports their business and frees them up keep their business running smoothly. 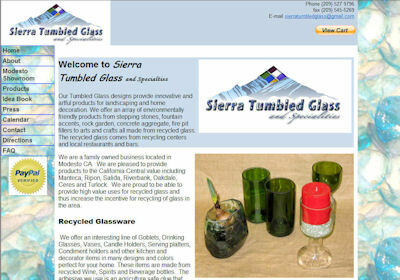 Sierra Tumbled Glass and Specialties makes a variety of products from recycled glass. Their show room is in an industrial area so it does not get a lot of walk-in business. They needed a website and lots of web presence support to make sure people in the central valley could easily locate them and get to their showroom. They also wanted to reach a wider market with their unique products. I set up an online store on their website where they can sell their products nationwide. I set up the detailed pages for the products and linked them to shopping cart services provided by PayPal. I also provide a product feed to list their products in Google Marketplace. The extra sales from the online shop has helped insure their local business is a success. What Goes Around antiques is a small family run shop that needed to let people know where they were and when they were open. They were new to town and needed to have a good web presence to let people know where they were. Because they were family run they are not open every day. Having the businesses directories list their hours of operation is critical to avoid disappointed customers who might come on days they were closed. Because the shop is small without a lot of events the actual website did not need to be too big. 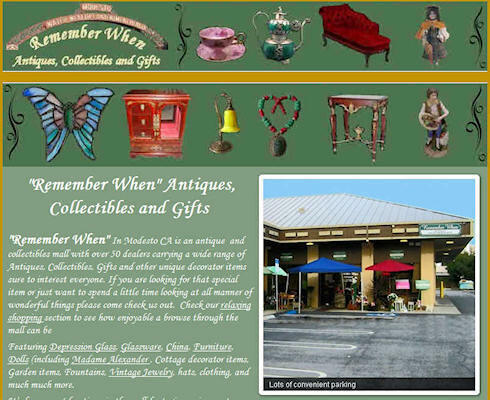 The merchandise page and tour of the shop is enough to let new customers see what they have.